Despite being a legendary game designer, Super Mario Bros. creator Shigeru Miyamoto has no idea what to do with the next F-Zero entry. Do you like driving at the speed of sound? Do you like physically impossible loops scattered around your racetracks? How about Captain Falcon; You like him, right? Unfortunately, it doesn't look like we'll be returning to the world of F-Zero anytime soon. "I certainly understand that people want a new F-Zero game," states Nintendo's resident game design deity Shigeru Miyamoto. "I think where I struggle is that I don't really have a good idea for what's new that we could bring to F-Zero that would really turn it into a great game again. Certainly I can see how people looking at Mario Kart 8 could see, through the anti-gravity, a connection to F-Zero. 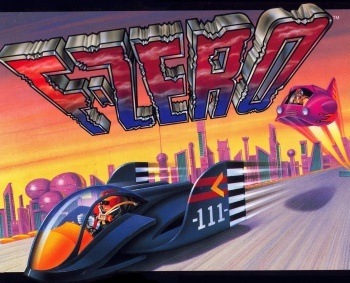 But I don't know, at this point, what direction we could go in with a new F-Zero." That anti-gravity bit mentioned by Miyamoto can be found at the :35 mark of the recently-released debut trailer for Mario Kart 8, and he's right, it does look like an idea lifted from F-Zero. It should be stated that despite Miyamoto's claims, we have no doubt that a new F-Zero will eventually emerge. Maybe the developers don't know exactly what to do with the game currently, but given enough time they'll come up with something. Kid Icarus lay dormant for more than two decades before Nintendo cobbled together a new title for that franchise, and this is Nintendo, after all: The company can't not create sequels to first-party franchises. That's basically the firm's life blood. Intriguingly, Miyamoto addresses this point in a roundabout way by discussing the pressure on Nintendo to continue churning out familiar classics. "It's tough," he states. "We come to [E3 2013] and we bring a lot of great franchises and everyone says, 'Oh, well, where's this game that I want to play? Where's something new?' I only have so much capacity." Obviously in the past we've tried to work with other companies, where we've let them develop games for us in franchises like Star Fox and F-Zero, but the more we think about it, the more we prefer to be able to create those games internally, on our own. We've obviously, as I mentioned, been working on what we can do to increase our internal staff in a way that will allow us to have more projects going at the same time, so we can create new games and work on additional old IP and still maintain the other primary franchises that people want to see." So there you have it: Nintendo isn't going to be making a new F-Zero soon, and neither is anyone else. Try not to be too broken up at this news.